[From Figure/Ground] I've been sitting on these photos for almost a month now. I think partly because I just wasn't that excited by the building. It's a bit cluttered when you try to take the whole complex in at once. But examined up close, it has its moments. 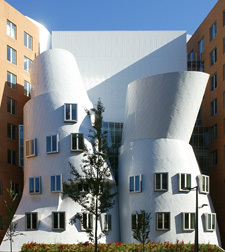 Gehry has his detractors, usually people who are suspicious of the idea of architecture as sculpture. There does not at first seem to be a lot of form-follows-function about his work. My own doubts about Gehry tend to build up over time in this way—and then I go to see one of his buildings, and come away charmed. Gehry, who for the first half of his career had an utterly pragmatic grounding in reality working for big commercial firms of architects, has never lost that practical touch. Inside, his buildings work. They are not haphazard. Every space is thought through.